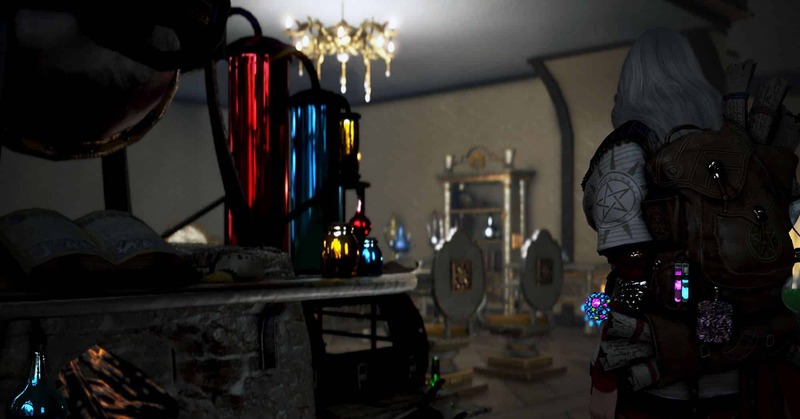 Crafting alchemy stones is a way to make a lot of money in Black Desert. We're taking a close look at the recipe & the materials you will need. Unfortunately most information you will find online regarding the alchemy stone recipe is wrong. The ingredient amounts you will find in many discussions and articles will only make you lose a good amount of rare resources, and scare you away from one of the most profitable BDO activities. Let’s dive into alchemy stones further, explaining in (understandable) detail everything that you should know, whether you are looking to make a few good ones for your characters, or become rich in the process. All right, the most important thing first. The recipe! Let’s start from the easiest one, to the hardest. If you’ve already started leveling Alchemy on your character, then most probably you already have a big stock of Clear Liquid Reagents & Pure Powder Reagents in your storage. 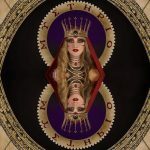 So many, that you will realize you won’t need any more for a few dozen alchemy stone craft attempts – which you are not going to get easy, or cheap. You don’t want to start crafting alchemy stones with a low Alchemy level, as a) you can’t, and b) it’s a huge waste of money. Luckily for you, the best way to level alchemy up to Skilled 10, is by crafting Clear Liquid Reagents and Pure Powder Reagents. You can gather these while gathering bushes, thickets, wild herbs etc. in the wild (bare-handed or with hoe). There used to be a misconception about Weeds, that they are a “trash-vendor” item, but this is not the case. They are actually extremely helpful, since they can substitute Wild Grass in almost all recipes, and they are far easier to farm. Buy Empty Bottle from Material Vendor, and right-click it while standing on a river (the Heidel fountain works too). You will gather Bottle of River Water, which you can then Processing -> Filter to Purified Water. Again, an “easy” material, since there’s a total of 6 gathering nodes that produce Powder of Time, and it’s a good idea to use a Human Worker on them, preferably Skilled at least. 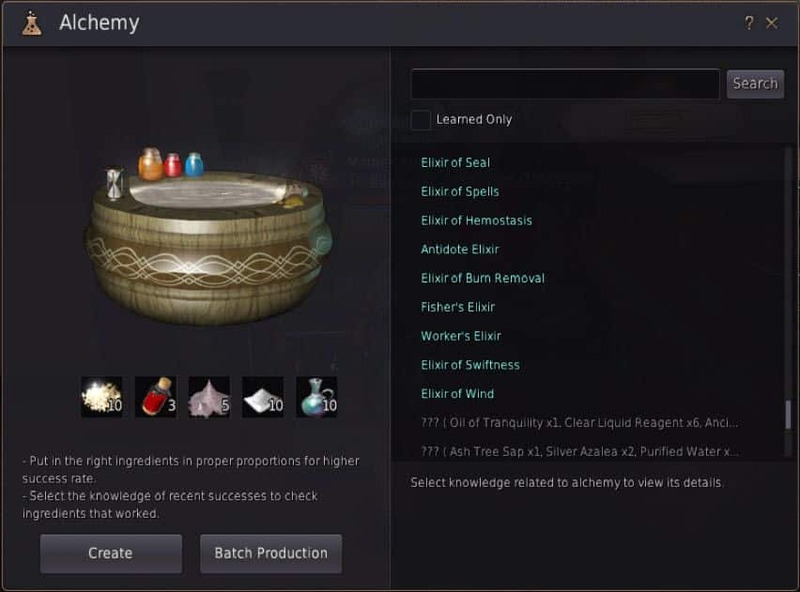 You won’t need more than one node for your alchemy stone needs (well, you can even not get one at all), but there are various uses for Powder of Time, so you should check the recipes and decide for yourself the amount you will need. Sinner’s Blood is a bit more tricky to make, but nevertheless a very good recipe to level Alchemy from Professional 1 and onward. You will need to gather a lot of bloods from the 2nd group (deer, sheep, pig, waragon & ox) which is the easy part. Clear Liquid Reagents, you already got ’em. Hopefully, Bloody Tree Knots, and Powder of Flame can be gathered from many nodes. And here comes the hardest, grindy-est part. Everything else is a piece of cake compared to this one. The only good news I can give you, is that if you will be AFK-Alchemy-ing a lot, you will slowly amass them. You see, it’s one of the “special drops” you get out of making Alchemy recipes (like the byproducts from Cooking of Farming), but this one is even more special, because it only drops from certain recipes of a higher lifeskill level. So as you guessed, there is no way around it, you have to AFK (as well as active-gather) long hours if you’re planning to invest on alchemy stones. There is no “best” recipe to make in order to farm Shining Powder, so you might as well do your research beforehand. You could look into potions that you can turn into alchemy boxes with Imperial Alchemy, then sell for a nice sum of NPC gold, high-price elixirs or high-level ingredients needed for crafting, or even stock up your characters with some strong buffs for the long-term. It is suggested that you focus on bloods and oils, since you can use them for recharging / polishing your stones later on. Oils are expensive to make however, so not the most viable option. It’s better to stick with bloods. The most important thing you should be aware of before crafting, is the drop rates i.e. what you will expect to get. So it might take a few attempts to get the one you’re after, and of course most probably its quality isn’t going to be.. outstanding! Alchemy stones can be upgraded from Level 1 through Level 8, and they come in 4 different rarities (grades). When upgrading a stone through Growth, you have a chance to upgrade its level, grade, or both. Take a look at the table below, in order to familiarize yourself with the available options, and set your goals accordingly. It’s definitely worth noting, that as of 29/11/2018, not even a single Splendid stone has been sold through the marketplace, while only 1 Shining Alchemy Stone of Protection has been sold for 1.3 billion silver. There is a special interface for managing your alchemy stones, and you can find it on the bottom of your inventory. Let’s see how each different function works. Alchemy stones provide their bonuses only when equipped, and activated. You activate it by pressing U, and there is a cooldown for which it will provide its benefits. You can check a box in your inventory, to make the alchemy stone automatically renew the cooldown, when it finishes. Each use, will cost 1 durability for the stone, which you can recover with the Recharge function. In the second window, you can Polish your alchemy stone, therefore raising its XP (max 150%), and its chances of upgrading through Growth. Destruction (offensive) stones use Ingots and Crystals. Protection (defensive) stones use Plywoods. Life (lifeskill) stones use High & Special Quality Crops, Mushrooms etc. Many people argue that the most profitable Growth attempts are made at 80% XP, since it’s the lowest amount where you can have an actual attempt. However, that statement would need a ton of data as a backup, to prove that in the long term it’s a better investment. I personally always go for the max chance, with 150% XP. The table below is the only liable data-mining that currently exists on Alchemy Stones, once more an amazing work from Incendar. All the values are based on 150% XP Growth attempts. Would be interessted in information about the use of alchemy stones needed to make vell. Is it better to upgrade your stones ect. I’m a bit confused by your question Dumble. Vell’s Heart is indeed a form of “rare alchemy stone”, and it drops directly from the Vell World Boss. Vell’s Concentrated Magic drops as well, which you can use along with 1.500 (!) Alchemy Stone Shards in order to craft Vell’s Heart. 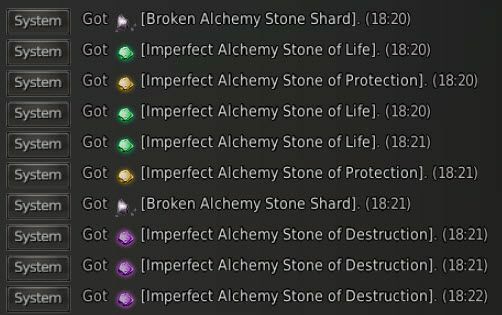 Alchemy Stone Shards are extracted from alchemy stones (an Imperfect alchemy stone would yield 1 alchemy stone shard, but a sharp one could even yield 1.5K by itself). It’s also worth noting, that Vell’s Heart offers the same stats with the Sharp Alchemy Stone of Destruction. How character alchemy level affects these stats? And is it the same using 1 black stone or more in every growth attempt? Luna, I’m not quite sure what do you mean about the alchemy level. Which stats?? The higher the alchemy level, the more “procs” you have out of each crafting. So for example if Skilled 1 Alchemist, you might get 350 products from 250 crafts, but get 500 products from 250 crafts if you are Artisan 1 Alchemist (the values are kinda random here, just trying to make a point). There’s also various “byproducts”, which can only proc after certain Levels, that really depends on the item though. For example, if you are crafting Elixir of Time with a Professional 1 + Level, you can also get the higher version, Elixir of Flowing Time. So to answer your question, the Alchemy level will determine how much Shining Powder you make for example. Lats but not least, you can only attempt higher alchemy stone upgrades with higher Alchemy Tier (for example, Skilled, Professional, Artisan etc. will unlock a higher grade of alchemy stone you can attempt). Regarding black stones, no choice there, you can only use a single black stone each time, although the UI might be a bit confusing on that.